Her last name destined her to a life in the theater and performing arts. Most may not know that so many of our memories of Christmas productions, at the beautiful Stanley Theater, were made possible due to this amazing woman; a highly talented, petite Jewish girl, from Ilion NY. Celebrate Christmas, Hanukkah, Kwanza, or Festivus Days 2016 and be grateful that Ilion's Pearle Singer Nathan had the intelligence, drive, ambition and love of the theater to save this beautiful structure. Pearle's father, Abraham B. Singer, was born in Lithuania in 1884. He immigrated to America in 1902. Her mother, Sadie Silverman, was born in Russia, daughter of Rabbi Hershel and Chaya Mina Saltzman Silverman. She moved to New York City in 1893. On August 11, 1911, in New York City, Abraham Singer married Sadie. Lillian Singer, their first of three daughters, was born on June 12, 1912. Pearle was born on October 27, 1913 in Utica, NY. The Singer family moved to Ilion, to live on John Street, in 1914. Daughter Florence was born in 1918 and a son, Hershel Leonard in 1920. Abraham Singer was a successful Ilion businessman and owned and operated a men's haberdashery and clothing store on Central Avenue in Ilion. He also successfully operated the A. B. Singer Realty firm for many years. He later owned and operated a men's clothing store on Bleecker Street in Utica. While living in Ilion, from 1913 to 1948, the Singers raised their family with a strong appreciation of music and literature and nurtured their children's interest in the arts and culture. During high school, Pearle was a member of the Drama Club for three years. She won oratorical contests and participated in dramatic productions. She graduated from Ilion High School, in 1930, when she was only 16 years old. Her older sister, Lillian, also graduated as a member of the 1930 class. After graduation, Pearle attended the Leland Powers School of the Theater in Boston, Mass. She studied with Margaret Prendergast McClean, one of America's foremost authorities on diction and with Moroni Olson, actor and director. She completed graduate courses at Boston University and the American Academy of Dramatic Art. She returned to Utica in 1933 where she, along with Irene Babcock, opened the School of Speech and Dramatic Art. Pearle married Utica businessman, Harris Garson 'Gar' Nathan on June 19, 1934 at Temple Beth El in Utica. Gar Nathan was a partner in the Utica firm of Abe Nathan & Sons. Pearle stayed at home to raise their three daughters, Susan, Andrea and Bonnie while remaining very active in local groups. They started their family at 113 Sherman Place in Utica. In 1937, The Junior Players was organized by and for boys and girls interested in speech. Pearle served as a director for the organization. She also taught classes in voice and diction for the Business Girls Federation of YWCA. She was Program Chairman at the local USO Club during World War II. She was President of the Utica Section, New York State Council of Jewish Women in 1942-43. She and her husband were members of Temple Beth El for over 50 years. She managed a school of speech for 10 years. She taught speech and directed plays at the YWCA, for five years, before becoming speech instructor at Utica Catholic Academy. She traveled extensively throughout central New York performing interpretations of literature. She was chairman of the Family and Children's Division of the Community Chest and Planning Council; was vice president of the B Sharp Club; a board member of Utica College Foundation and of the Children's Theater and the Chest. Pearle was a an advocate for education institutions and Utica College in particular. Utica College opened in 1947 and Pearle contributed to the fund raising efforts needed for the college's future. She was appointed to the Utica College Foundation Board in 1958. She was the only female serving on the Board. She obtained her own Bachelor of Arts degree, from Utica College, in 1945 when she was 45 years old. In 1980, Utica College presented Pearle with its Outstanding Alumnus Award. A scholarship, the Pearle Nathan-Broadway Theater League Scholarship, was established in 1991. The award is presented annually to a Utica College student majoring in speech communication and dramatic arts. In 1937, The Junior Players was organized by and for boys and girls interested in speech. Pearle served as a director for the organization. She also taught classes in voice and diction for the Business Girls Federation of YWCA. During World War II, she was Program Chairman at the local USO Club. She was President of the Utica Section, New York State Council of Jewish Women in 1942-43. She and her husband were members of Temple Beth El for over 50 years. 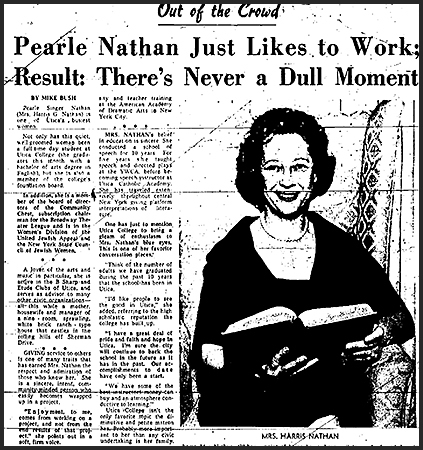 Pearle Singer Nathan was featured in the Utica Observer newspaper feature, "Out of the Crowd", in May 1959. The reporter, Mike Bush, chronicled her many activities, achievements and interests. 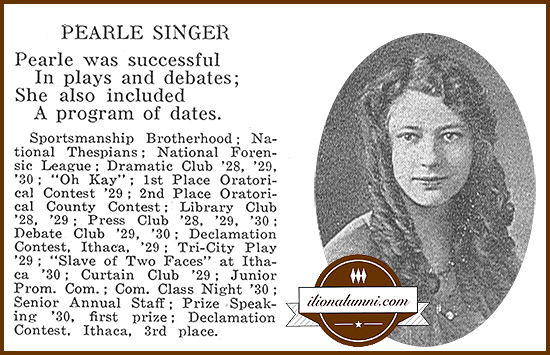 "After her graduation from llion High School, where she participated in drama and speech, Pearle Singer attended the Leland Powers School of the Theater in Boston. There the energetic young girl completed a three-year course in two." "She watches this house like it was a baby," Mr. Nathan (everyone calls him "Gar") offered. "In fact, she designed every inch of the house. The only thing the architect had to do was draw the plans from her ideas." Their home was built in 1954 at 6 Sherman Circle in New Hartford, NY. "Probably more important to her than any civic undertaking is her family." The article included information about her daughters: Sue (Sonny), 21 and a student at the University of Wisconsin; Andrea (Andy), 18, a freshman at Syracuse University; Bonnie-Lisa (Bonnie), a freshman at New Hartford Central School; and the family dog, Candy, a seven-year-old cocker spaniel. "Mrs. Nathan makes a point of being home, however pressing her other engagements when her children return from school. In fact, she has a twice-yearly chore of baking and sending to the girls 200-300 cookies and cakes." In June 1984, Pearle and Gar Nathan celebrated their 50th wedding anniversary with a cruise of the button chain of lakes. A reception followed in the Old Forge Community Arts Center. The couple was married on June 17, 1934 in Temple Beth El. At the time of the 50th party, they had three daughters: Mrs. Warren (Bonnie) Kowaisky, Syracuse; Mrs. David (Andrea) Chapin, Boston. Mass., and Mrs. Fred (Susan) Gachowski, Utica. They had nine grandchildren. "The theater is not a hobby for me," she said. "I look at the theater as art -- an art form depicting life and therefore this is something to be worked at." Pearle certainly did work at the theater, and in fact, was instrumental in saving our beloved Stanley Theater. The Observer Dispatch February 3, 1955 edition lauded her, "Mrs. Nathan is recognized as one of the foremost local actresses." She had the lead role of Blanche DeBois, for the February 1955, Theater Workshop production of Tennessee Williams' drama "Street Car Named Desire". There were four performances in the Mohawk Valley Technical Institute [now MVCC] auditorium. She also played the lead role, as Regina Hubbard Giddens, in Lillian Hellman's 1939 Little Foxes and its prequel 1946 Another Part of the Forest. She also directed plays. In May 1948, she directed Golden Boy, a drama in three acts by Clifford, Odets for the Theater Workshop. Her husband was a member of the cast. The show was presented in the Proctor High School auditorium. A group of people (Pearle Nathan, John Farquhar, Margaret N. Terry, F. Gark Laurie and others) who were interested in the arts believed there was a need for professional touring companies to perform in Utica. In the mid-1950s, they worked out a plan with Columbia Artists to bring Broadway touring shows to Utica. The first of the shows was "Auntie Mame" in April of l958. They officially organized as The Greater Utica Broadway Theatre League, which was made up of representatives of many area civic organizations, such as the Utica Rotary Club, and board members of Utica College. 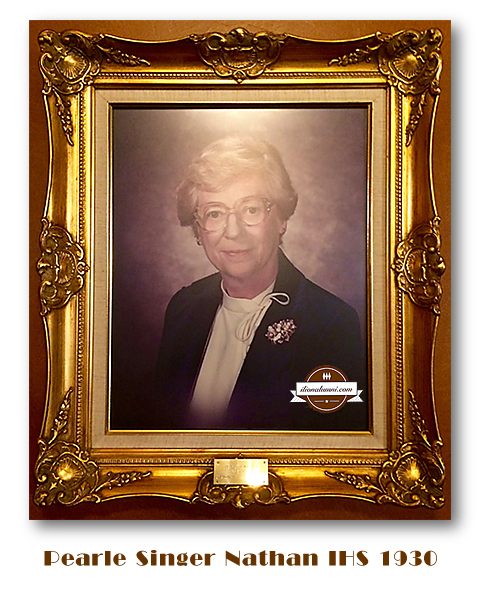 Pearle was with the organization since its inception in 1959 and served as its President for many years. 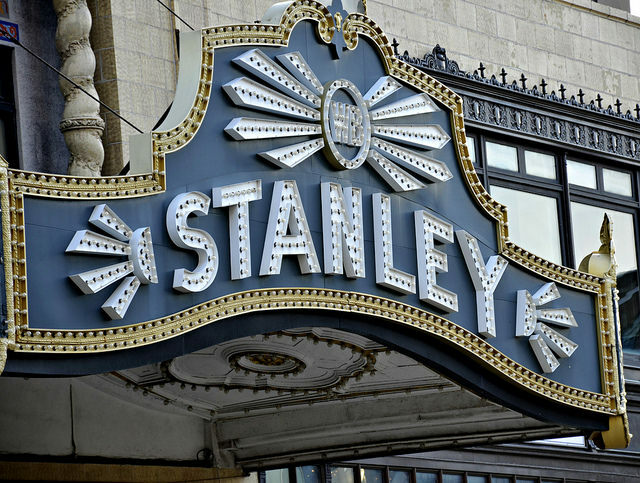 The Stanley Theater was taken over and rescued by the Central New York Community Arts Council (CNYCAC) in December 1974. Pearle was the President of the CNYCAC at that time and played a key role in the preservation of this majestic theater. 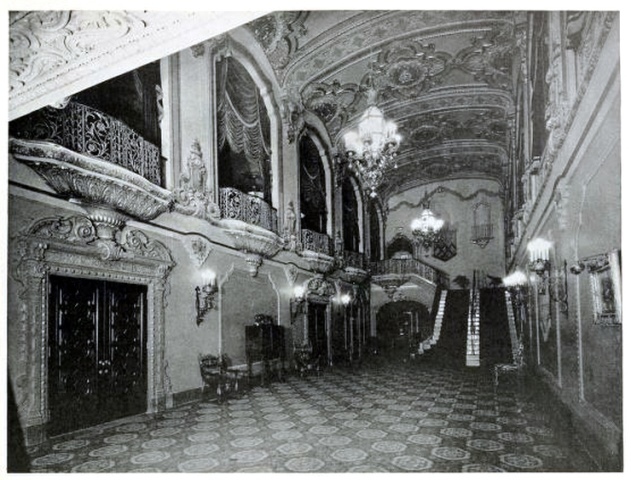 Her goal was that by acquiring the theater, it could serve as a step toward making Utica a musical and theatrical cultural center. Jonas Kover, who covered the Stanley Theater for the Daily Press and Observer-Dispatch, toured the facility in 1974 shortly after the Central New York Community Arts Council bought it. "It was dingy and the seats were torn," he said. "It just wasn’t doing very well then." Pearle Nathan, then-president of the arts council, also was on the tour. "We stole it," she whispered in his ear, Kover said. The arts group bought the theater for $135,000. "They were very excited about obtaining the theater," said Kover, who retired from the O-D in 2003. The council hired the Syracuse firm of Cooper Decorators to bring in specialists to draw up a list of priorities for restoration and renovation. By early 1975, they had installed two boilers at a cost of $60,000 and 1,455 new light bulbs. The roof was repaired and the sound and lighting systems were overhauled. The theater's 2,963 seats were replaced. Carpeting, air-conditioning systems, furniture, lighting, and the screen and projection system were all restored. Painting, touching up the gold leaf, replacing the drapes and restoration of the marquee were included in the final restoration. As President of the CNYCAC, Pearle had a major role in preserving this landmark. The theater was listed, on the National Register of Historic places, which made it eligible for restoration grants from state and federal sources. 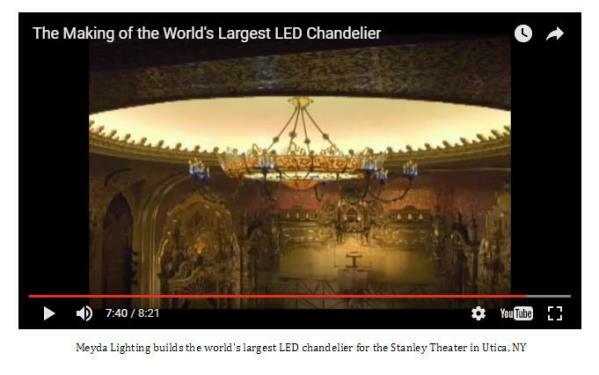 The World's largest LED Free-Hanging Chandelier was designed, manufactured and installed by Meyda Lighting, in 2014, at the historic Stanley Center for the Arts in Utica, New York. Surely, Pearle (Singer) Nathan would be proud to see this grand and gorgeous piece of art displayed in her beloved Stanley Theater. 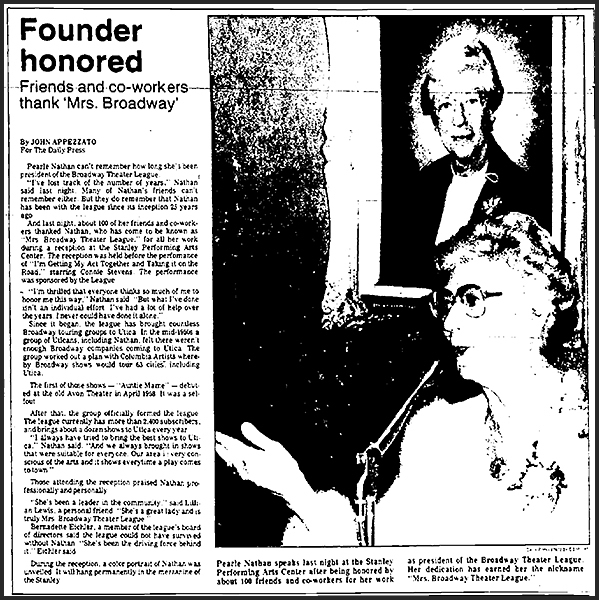 Pearle Nathan was honored at a reception by the Broadway Theater League (BTL) in October 1982. A color portrait of Pearle (Singer) Nathan was unveiled for the Stanley's mezzanine. She was the President of the Broadway Theater League and her dedication had earned her the nickname of "Mrs. Broadway Theater League." "She's been a leader in the community," said Lillian Lewis, a close friend. "She is a great lady and is truly Mrs. Broadway Theater League." Pearle and her husband, Gar Nathan, moved to Syracuse in 1980 to be near their daughter. Her husband died in 1990 at the age of 78. Pearle passed away, in the Alzheimer's Unit of the Loretto Rest Nursing Home, on January 19, 1996. She was 83 years old. Pearle's daughters, Mrs. Robert (Susan) Jackson, Mrs. Steve (Bonnie) Engel and Mrs. David (Andrea) Chapin and grandchildren survived her. In June 2011, one of the last Ilion High graduating classes held its Senior Awards Assembly at the magnificent Stanley Theater. Many do not know that the theater stands today, in part, due to the amazing dedication of Ilion 1930 Alumnus Pearl (Singer) Nathan. She was a member of a cast of characters who truly loved this theater and the arts. The next time you enter the Stanley Theater, perhaps you can give a nod to the heavens for having sent Pearle to little old Ilion, NY, where she grew up, was educated and went on to make a world of difference! Peace on earth... Good will to men!